Arab Americans (Arabic: عَرَبٌ أَمْرِيكِيُّونَ‎ or أمريكيون عرب) are Americans of either Arab ethnic or cultural and linguistic heritage or identity, who identify themselves as Arab. Arab Americans trace ancestry to any of the various waves of immigrants of the countries comprising the Arab World. According to the 2010 U.S. Census, there are 1,698,570 Arab Americans in the United States. 290,893 persons defined themselves as simply Arab, and a further 224,241 as Other Arab. Other groups on the 2010 Census are listed by nation of origin, and some may or may not be Arabs, or regard themselves as Arabs. The largest subgroup is by far the Lebanese Americans, with 501,907, followed by; Egyptian Americans with 190,078, Syrian Americans with 148,214, Iraqi Americans with 105,981, Moroccan Americans with 101,211, Palestinian Americans with 85,186, and Jordanian Americans with 61,664. Approximately 1/4 of all Arab Americans claimed two ancestries. A number of peoples that may have lived in Arab countries and are now resident in the United States are not classified as Arabs, including Assyrians (aka Chaldo-Assyrians), Jews, Kurds, Iraqi Turkmens, Azeris, Mandeans, Circassians, Shabaki, Armenians, Turks, Georgians, Yazidis, Balochs, Iranians and Kawliya/Romani. The majority of Arab Americans, around 62%, originate from the region of the Levant, which includes Syria, Lebanon, Palestine and Jordan, although overwhelmingly from Lebanon. The remainder are made up of those from Egypt, Somalia, Morocco, Iraq, Libya, the GCC and other Arab nations. Sorting by American states, according to the 2000 U.S. Census, 48% of the Arab-American population, 576,000, reside in California, Michigan, New York, Florida, and New Jersey, respectively; these 5 states collectively have 31% of the net U.S. population. Five other states - Illinois, Texas, Ohio, Massachusetts, and Pennsylvania - report Arab-American populations of more than 40,000 each. Also, the counties which contained the greatest proportions of Arab-Americans were in California, Michigan, New York, Florida, New Jersey, Ohio, Pennsylvania, and Virginia. The cities with 100,000 or more in population with the highest percentages of Arabs are Sterling Heights, Michigan 3.69%; Jersey City, New Jersey 2.81%; Warren, Michigan 2.51%; Allentown, Pennsylvania 2.45%; Burbank, California 2.39% and nearby Glendale, California 2.07%; Livonia, Michigan 1.94%; Arlington, Virginia 1.77%; Paterson, New Jersey 1.77%; and Daly City, California 1.69%. Bayonne, New Jersey, a city of 63,000, reported an Arab-American population of 5.0% in the 2010 US Census. Arab population by state in the USA in 2010. While the majority of the population of the Arab world is Muslim, most Arab Americans, in contrast, are Christian. The percentage of Arab Americans who are Muslim has increased in recent years because most new Arab immigrants tend to be Muslim. This stands in contrast to the first wave of Arab immigration to the United States between the late 19th and early 20th centuries, when almost all immigrants were Christians. Most Maronites tend to be of Lebanese or Syrian; those Palestinians often Eastern Orthodox, otherwise Roman Catholic and a few Episcopalians. 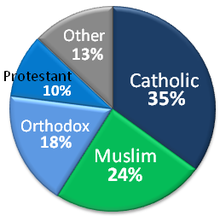 A small number are Protestant adherents, either having joined a Protestant denomination after immigrating to the U.S. or being from a family that converted to Protestantism while still living in the Middle East (European and American Protestant missionaries were fairly commonplace in the Levant in the late 19th and early 20th centuries). Arab Christians, especially from Lebanon, Iraq, Syria, and Egypt, continue to immigrate into the U.S. in the 2000s and continue to form new enclaves and communities across the country. 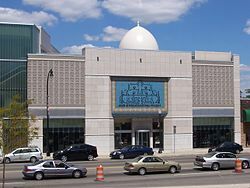 The Arab American National Museum in Dearborn, Michigan celebrates the history of Arab Americans. Paterson, New Jersey has been nicknamed Little Ramallah and contains a neighborhood with the same name, with an Arab American population estimated as high as 20,000 in 2015. The United States Census Bureau is presently finalizing the ethnic classification of MENA populations. This process does not pertain to Jewish, Muslim, Christian, Sikh and other religious adherents, whom the bureau tabulates as followers of a religion rather than members of an ethnic group. In 2012, prompted in part by post-9/11 discrimination, the American-Arab Anti-Discrimination Committee petitioned the Department of Commerce's Minority Business Development Agency to designate the MENA populations as a minority/disadvantaged community. Following consultations with MENA organizations, the Census Bureau announced in 2014 that it would establish a new MENA ethnic category for populations from the Middle East, North Africa and the Arab world, separate from the "white" classification that these populations had previously sought in 1909. The expert groups, including some Jewish organizations, felt that the earlier "white" designation no longer accurately represents MENA identity, so they successfully lobbied for a distinct categorization. As of December 2015, the sampling strata for the new MENA category includes the Census Bureau's working classification of 19 MENA groups, as well as Turkish, Sudanese, Djiboutian, Somali, Mauritanian, Armenian, Cypriot, Afghan, Iranian, Azerbaijani and Georgian groups. The Arab American Institute and other groups have noted that there was a rise in hate crimes targeting the Arab American community as well as people perceived as Arab/Muslim after the September 11 attacks and the US-led 2003 invasion of Iraq. A new Zogby Poll International found that there are 3.5 million Americans who were identified as "Arab-Americans", or Americans of ancestry belonging to one of the 23 UN member countries of the Arab World (these are not necessarily therefore Arabs). Poll finds that, overall, a majority of those identifying as Arab Americans are Lebanese Americans (largely as a result of being the most numerous group). The Paterson, New Jersey-based Arab American Civic Association runs an Arabic language program in the Paterson school district. 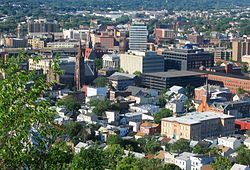 Paterson, New Jersey has been nicknamed Little Ramallah and contains a neighborhood with the same name, with an Arab American population estimated as high as 20,000 in 2015. Neighboring Clifton, New Jersey is following in Paterson's footsteps, with rapidly growing Arab, Muslim, and Palestinian American populations. In a 2007 Zogby poll, 62% of Arab Americans vote Democratic, while only 25% vote Republican. The percentage of Arabs voting Democratic increased sharply during the Iraq War. However, a number of prominent Arab American politicians are Republicans, including former New Hampshire Senator John E. Sununu, and California Congressman Darrell Issa, who was the driving force behind the state's 2003 recall election that removed Democratic Governor Gray Davis from office. The first woman Supreme Court Chief Justice in Florida, Rosemary Barkett, who is of Syrian descent, is known for her dedication to progressive values. Arab Americans gave George W. Bush a majority of their votes in 2000. However, they backed John Kerry in 2004 and Barack Obama in both 2008 and 2012. They also backed Hillary Clinton in 2016. According to a 2000 Zogby poll, 52% of Arab Americans are pro-life, 74% support the death penalty, 76% are in favor of stricter gun control, and 86% want to see an independent Palestinian state. In a study, Arab Americans living in Detroit were found to have values more similar to that of the Arab world than those of the general population living in Detroit, on average, being more closely aligned to the strong traditional values and survival values. This was less the case when participants were secular, or belonged to second and subsequent generations. There are many U.S. immigrants from the Arab world who are not classified as Arabs. Among these are Armenian Americans, Kurdish Americans and Jewish Americans of Mizrahi origin. Some of these groups such as Assyrians and Chaldeans are Semites, while the vast majority of the rest are not Semites. It is very difficult to estimate the size of these communities. For example, some Armenians immigrated to the U.S. from Lebanon, Syria, or Iraq. Estimates place these communities at least in the tens of thousands. Other smaller communities include Assyrians (a.k.a. Chaldo-Assyrians), Berber tribes, Turkmen people, Mandeans, Circassians, Shabaki, Turks, Mhallami, Georgians, Yazidis, Balochs, Iranians, Azerbaijans and Kawliya/Roma. Most of these ethnic groups speak their own native languages (usually another Semitic language related to Arabic) and have their own customs, along with the Arabic dialect from the Arab country they originate from. Aviva Uri, in her study of Mizrahi Jews in America, writes that "activists and writers in the United States, both gentile Arab and Jewish, are legitimizing through their various activities and publications the identity of Mizrahim as Arab Jews." In 2014, Montgomery County, Maryland designated April as Arab American Heritage Month in recognition of the contributions that Arab Americans have made to the nation. The first documentary on Arab Americans premiered on PBS in August of 2017, The Arab Americans features the Arab American immigrant story as told through the lens of American History and the stories of prominent Arab Americans such as actor Jamie Farr, Ralph Nader, Senator George Mitchell, White House Reporter Helen Thomas, Pulitzer Prize winning journalist Anthony Shadid, Danny Thomas actor and Founder of St. Jude Children's Research Hospital, pollster and author John Zogby, Congressman Nick Rahall, racing legend Bobby Rahal. The documentary is produced and directed by Abe Kasbo. While the spectrum of Arab heritage includes 22 countries, their combined heritage is often celebrated in cultural festivals around the United States. The Annual Arab-American & North African Street Festival was founded in 2002 by the Network of Arab-American Professionals of NY (NAAP-NY). Located in downtown Manhattan, on Great Jones Street between Lafayette & Broadway, the Festival attracts an estimated 15,000 people, in addition to over 30 Arab and North African vendors along with an all-day live cullltural performance program representing performers from across the Arab world. The New York Arab-American Comedy Festival was founded in 2003 by comedian Dean Obeidallah and comedian Maysoon Zayid. Held annually each fall, the festival showcases the talents of Arab-American actors, comics, playwrights and filmmakers, and challenges as well as inspires fellow Arab-Americans to create outstanding works of comedy. Participants include actors, directors, writers and comedians. Of particular note is ArabFest in Seattle, begun in 1999. The festival includes all 22 of the Arab countries, with a souk marketplace, traditional and modern music, an authentic Arab coffeehouse, an Arabic spelling bee and fashion show. Lectures and workshops explore the rich culture and history of the Arab peoples, one of the world's oldest civilizations. Also of new interest is the Arabic rap concert, including the NW group Sons of Hagar, showcasing the political and creative struggle of Arabic youth. 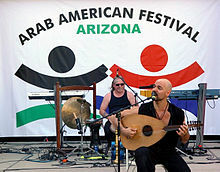 In 2008, the first annual Arab American Festival in Arizona was held on 1 and 2 November in Glendale, Arizona. There were more than 40,000 attendees over the two-day event; more than 35 international singers, dancers and musicians from all over the Arab World performed 20 hours of live entertainment on stage. Activities included folklore shows, an international food court, hookah lounge, kids rides and booth vendors, open to the public, and admission was free. The Annual Arab American Day Festival is a three-day cultural and entertainment event held in Orange County. Activities include book and folk arts exhibitions, speeches from community leaders in the county, as well as music and poetry, dancing singing, traditional food, hookah and much more. Since 1996, Milwaukee's Arab World Fest has been part of the summer festival season. It is held during the second weekend of August. This three day event hosts music, culture and food celebrating the 22 Arab countries. The festival features live entertainment, belly dancing, hookah rental, camel rides, cooking demonstrations, a children's area and great Arab cuisine. It is a family friendly festival on Milwaukee's lakefront. For a more comprehensive list, see List of Arab Americans. Here are a few examples of famous Arab Americans and Americans with partial Arab ancestry in a variety of fields. ^ In this list are not included Sudanese since, in 2000 and 2010, Sudan and South Sudan were yet one country and yet we only have quantitative data from these groups together. Only the people of Northern Sudan are Arabs, but most Sudanese Americans hailed from the South Sudan. The 2000 - 2010 US Census indicate not the number of Americans of Sudanese (excluding South Sudanese) origin or descent. ^ a b "B04003. Total Ancestry Reported". United States Census Bureau. 2013 American Community Survey 1-Year Estimates. Retrieved 17 July 2016. ^ "Demographics - Arab American Institute". www.aaiusa.org. ^ "Texas" (PDF). Arab American Institute. 2003. Archived from the original (PDF) on 7 February 2012. Retrieved 26 November 2012. ^ Data Access and Dissemination Systems (DADS). "American FactFinder - Results". Retrieved 18 March 2015. ^ "Arab American Population Highlights" (PDF). Arab American Institute Foundation. Washington, DC. Archived from the original (PDF) on 23 July 2011. Retrieved 7 July 2011. ^ de la Cruz, G. Patricia; Angela Brittingham (December 2003). "The Arab Population: 2000" (PDF). U.S. Census Bureau. Retrieved 17 October 2016. ^ "Table 1. First, Second, and Total Responses to the Ancestry Question by Detailed Ancestry Code: 2000". U.S. Census Bureau. Retrieved 2 December 2010. ^ "CITIZENSHIP STATUS IN THE UNITED STATES: Total population in the United States. 2006-2010 American Community Survey Selected Population Tables". U.S. Census Bureau. Retrieved 6 December 2013. ^ "Arab American Institute: Alabama" (PDF). ^ "Arab American Institute: Alaska" (PDF). ^ "Arab American Institute: Arizona" (PDF). ^ "Arab American Institute: Arkansas" (PDF). ^ "Arab American Institute: California" (PDF). ^ "Arab American Institute: Colorado" (PDF). ^ "Arab American Institute: Connecticut" (PDF). ^ "Arab American Institute: Delaware" (PDF). ^ "Arab American Institute: District of Columbia" (PDF). ^ "Arab American Institute: Florida" (PDF). ^ "Arab American Institute: Georgia" (PDF). ^ "Arab American Institute: Hawaii" (PDF). ^ "Arab American Institute: Idaho" (PDF). ^ "Arab American Institute: Illinois" (PDF). ^ "Arab American Institute: Indiana" (PDF). ^ "Arab American Institute: Iowa" (PDF). ^ "Arab American Institute: Kansas" (PDF). ^ "Arab American Institute: Kentucky" (PDF). ^ "Arab American Institute: Louisiana" (PDF). ^ "Arab American Institute: Maine" (PDF). ^ "Arab American Institute: Maryland" (PDF). ^ "Arab American Institute: Massachusetts" (PDF). ^ "Arab American Institute: Michigan" (PDF). ^ "Arab American Institute: Minnesota" (PDF). ^ "Arab American Institute: Mississippi" (PDF). ^ "Arab American Institute: Missouri" (PDF). ^ "Arab American Institute: Montana" (PDF). ^ "Arab American Institute: Nebraska" (PDF). ^ "Arab American Institute: Nevada" (PDF). ^ "Arab American Institute: New Hampshire" (PDF). ^ "Arab American Institute: New Jersey" (PDF). ^ "Arab American Institute: New Mexico" (PDF). ^ "Arab American Institute: New York" (PDF). ^ "Arab American Institute: North Carolina" (PDF). ^ "Arab American Institute: North Dakota" (PDF). ^ "Arab American Institute: Ohio" (PDF). ^ "Arab American Institute: Oregon" (PDF). ^ "Arab American Institute: Pennsylvania" (PDF). ^ "Arab American Institute: Rhode Island" (PDF). ^ "Arab American Institute: South Carolina" (PDF). ^ "Arab American Institute: South Dakota" (PDF). ^ "Arab American Institute: Tennessee" (PDF). ^ "Arab American Institute: Texas" (PDF). ^ "Arab American Institute: Utah" (PDF). ^ "Arab American Institute: Vermont" (PDF). ^ "Arab American Institute: Virginia" (PDF). ^ "Arab American Institute: Washington" (PDF). ^ "Arab American Institute: West Virginia" (PDF). ^ "Arab American Institute: Wisconsin" (PDF). ^ "Arab American Institute: Wyoming" (PDF). ^ a b "Arab Americans: Demographics". Arab American Institute. 2006. Archived from the original on 1 June 2006. Retrieved 18 March 2015. ^ "Arab Christians, minorities, reshaping US enclaves". Yahoo News. 11 November 2011. Retrieved 18 March 2015. ^ a b Deena Yellin (3 May 2015). "Palestinian flag-raising is highlight of heritage week in Paterson". North Jersey Media Group. Retrieved 4 May 2015. ^ "2015 National Content Test" (PDF). U.S. Census Bureau. pp. 33–34. Retrieved 13 December 2015. The Census Bureau is undertaking related mid-decade research for coding and classifying detailed national origins and ethnic groups, and our consultations with external experts on the Asian community have also suggested Sikh receive a unique code classified under Asian. The Census Bureau does not currently tabulate on religious responses to the race or ethnic questions (e.g., Sikh, Jewish, Catholic, Muslim, Lutheran, etc.). ^ "Lobbying for a 'MENA' category on U.S. Census" Wiltz, Teresea. USA Today. Published 7 October 2014. Accessed 14 December 2015. ^ "Public Comments to NCT Federal Register Notice" (PDF). U.S. Census Bureau; Department of Commerce. Retrieved 13 December 2015. ^ Cohen, Debra Nussbaum. "New U.S. Census Category to Include Israeli' Option". Haaretz. Retrieved 16 December 2015. ^ "2015 National Content Test" (PDF). U.S. Census Bureau. p. 60. Retrieved 13 December 2015. ^ "Paterson school district restarts Arab language program for city youths". Paterson Press, North Jersey Media Group. 10 December 2014. Retrieved 10 December 2014. ^ Andrew Wyrich (17 April 2016). "Hundreds in Clifton cheer raising of Palestinian flag". North Jersey Media Group. Retrieved 17 April 2016. ^ "US elections through Arab American eyes by Ghassan Rubeiz - Common Ground News Service". Archived from the original on 10 December 2014. Retrieved 18 March 2015. ^ "Arab american Demographics". Retrieved 18 March 2015. ^ Detroit Arab American Study Group (2 July 2009). Citizenship and Crisis: Arab Detroit After 9/11. Russell Sage Foundation. pp. 22–23. ISBN 978-1-61044-613-6. ^ "Total ancestry categories tallied for people with one or more ancestry categories reported 2011 American Community Survey 1-Year Estimates". United States Census Bureau. Retrieved 22 December 2012. ^ Ben-Ur, Aviva (2009). Sephardic Jews in America: A Diasporic History. New York: NYU Press. p. 35. ISBN 9780814786321. ^ Ben-Ur, Aviva (2009). Sephardic Jews in America: A Disasporic History. New York: NYU Press. p. 136. ISBN 9780814786321. ^ "April is Arab American Heritage Month". Montgomery College. Retrieved 26 December 2014. ^ "Arab-American & North African Cultural Street Festival 2017 in New York, NY | Everfest". Everfest.com. ^ "Live At Seattle Center". seattlecenter.com. ^ "Arab American Festival - المهرجان العربي الأمريكي". Retrieved 18 March 2015. ^ "Welcome arabworldfest.com - BlueHost.com". Retrieved 18 March 2015. Abraham, Nabeel, and Andrew Shryock, eds. Arab Detroit: From Margin to Mainstream (Wayne State UP, 2000). Cainkar, Louis A. Homeland insecurity: the Arab American and Muslim American experience after 9/11 (Russell Sage Foundation, 2009). Köszegi, Michael A., and J. Gordon Melton, eds. Islam in North America: A Sourcebook (2 vol. 1992). Based on state membership in the Arab League. This page was last edited on 18 April 2019, at 22:35 (UTC).